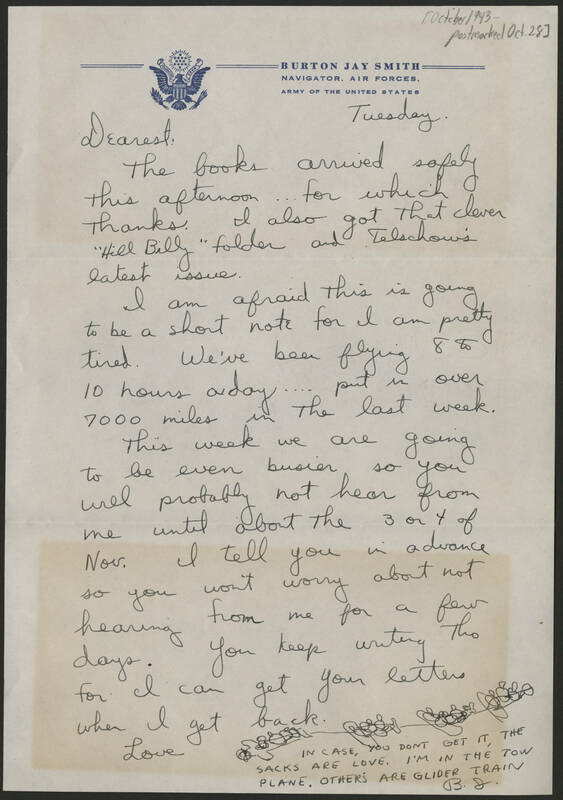 [October 1943 - postmarked Oct. 28] Tuesday Dearest: The books arrived safely this afternoon… for which thanks. I also got that clever "Hill Billy" folder and Telschow's latest issue. I am afraid this is going to be a short note for I am pretty tired. We've been flying 8 to 10 hours a day …. put in over 7000 miles in the last week. This week we are going to be even busier so you will probably not hear from me until about the 3 or 4 of Nov. I tell you in advance so you won't worry about not hearing from me for a few days. You keep writing tho for I can get your letters when I get back. Love IN CASE YOU DONT GET IT, THE SACKS ARE LOVE. I'M IN THE TOW PLANE. OTHERS ARE GLIDER TRAIN B.J.